Pairing food and wine has a reputation for being something only the experts can get a handle on. 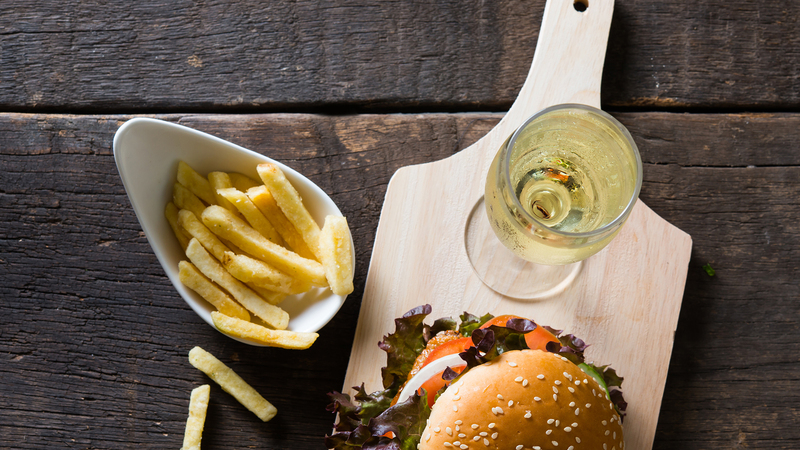 But sparkling wines like Champagne are actually known to pair fairly well with a lot of foods, and now one expert is claiming that the duo of french fries and Champagne is one of the best. In an interview with The Drinks Business, Marie-Christine Osselin, Moët & Chandon's wine quality and communication manager, said that junk food and Champagne actually go very well together. French fries are especially good with the drink according to Osselin. They're crispy, salty and fatty, all things that play well with the high acidity and fine bubbles of Champagne. She recommends a meal of fried oysters and French fries, though you could always upgrade to something like tempura lobster if you want to feel fancy. Osselin isn't alone in her thinking. Fried food has long been hailed as an ideal partner for bubbly. Top Chef alumnus Richard Blais has a Moët Champagne vending machine at his fried chicken restaurant, The Crack Shack. There's even a Champagne bar in San Francisco called The Riddler that specializes in pairing sparkling wines with foods like popcorn, tater tot waffles and caviar served with potato chips. The next time you want to class up your McDonald's order, swing by the store on your way home and pick up a bottle of bubbly. Your large fry will taste a lot classier with Champagne than a cup of Mountain Dew, that's for sure.